DO-17002-11 was succesfully added to your cart. Calibrations on temperature systems (meter and probe) are performed using direct comparison in high-stability liquid using high-precision and SPRT’s and displays. Measurements can be performed at four points between -197C and 1300C. Points are generally selected at standard ITS-90 points across the range of the probe but customer-specified points can be accommodated. Calibrating the probe and meter together produces the highest accuracies. 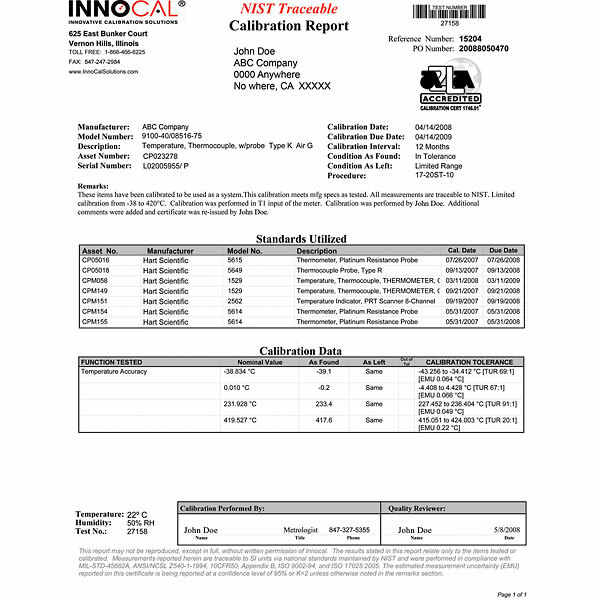 .InnoCal's Metrology Laboratory is accredited to ISO/IEC 17025 by the American Association for Laboratory Accreditation (A2LA); certificate number 1746.01. This accreditation is your assurance that one of the foremost outside auditing agencies approves of our internal laboratory policies and procedures. I have been so impressed by the service I have received the last couple of years. I plan on sending my Digital Thermometer every time it needs calibration. The guys at INNOCAL always take care of our needs above and beyond.